The pen is made in Black resin for the cap and Ivory White resin for the barrel. It has been embellished with challenging laser-cut engravings of his portrait and signature on the cap, and an excerpt from Swan Lake’s music original score. Sterling Silver trim has been applied to each of the 125 pens, etched with a Montegrappa logo and his lifetime years on the cap ring. The blind cap is inscribed with the Limited Edition number, while the signature clip resembles a flute, the composer’s favourite instrument. The cap top is fashioned with a slanted cut, with the “Sol” key central, embellished by the light of a diamond.The fountain pen is both converter and cartridge fed. The nib is made in 18k gold with a ballet-dancer from Swan Lake etched on its top. The pen is available in the writing grades of Fine, Medium and Broad. The second limited, called Black Swan, consists of fountain and rollerball pens, with 1840 examples of each to represent the year of his birth. Matching the form of the first model, this edition features resin coloured entirely in Black for both barrel and cap. 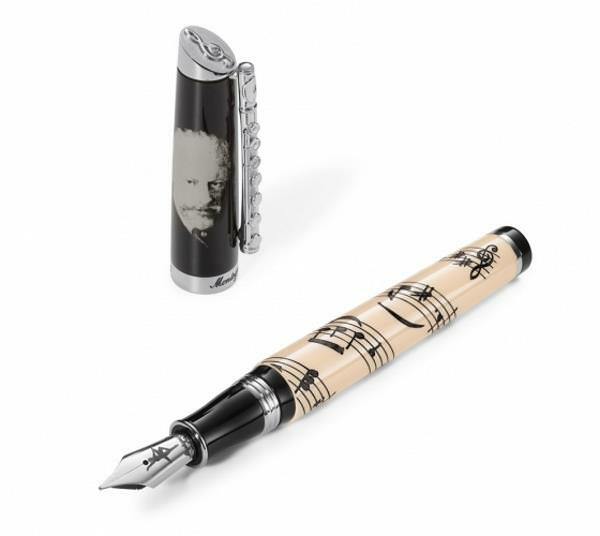 Its “Sol” key is enriched with a Swarovski crystal stone, and the cap is engraved with Tchaikovsky’s signature, while the barrel features an excerpt from Swan Lake’s music original score.